As a reporter, I’m usually on the other side of the pen and notepad, grilling folks with tough questions. But recently the tables turned, as I was interviewed for Eurocircle’s Expatriates-series. To read the Q&A about my life as a traveling writer, click here. 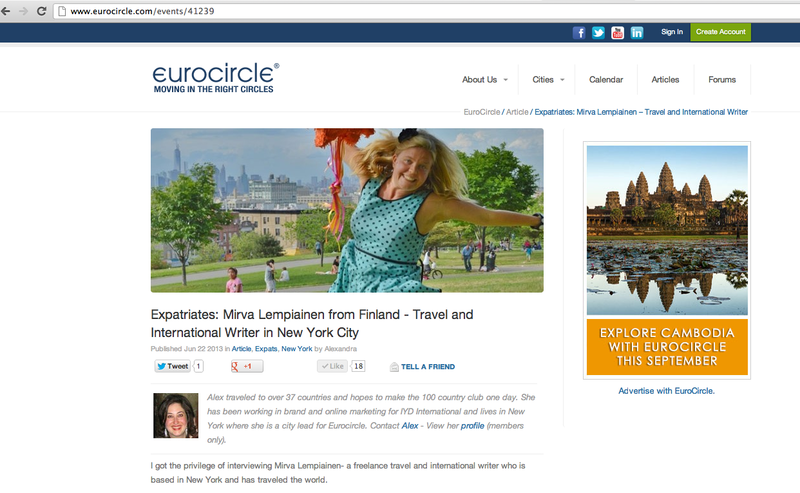 I first learned about Eurocircle in 2009, and shortly after that I interviewed Kaisa for an article about the organizations 10th anniversary. Nowadays I go to their various events in New York whenever I have the time. Most recently I attended one of their rooftop parties at Ava Lounge, which was a fun place to check out. So if you are in New York or any of the other cities that EC operates in, check out the events calendar and go mingle!